Bunney's table at the NEWGEN MEN and Fashion East Installations. SS: Your offering has evolved from a single item to something of a magpie's haven. Could you talk us through the latest additions? Andrew Bunney: I started Bunney with the simple idea to make something precious that anybody could use. This season I've investigated padlocks, charms and chains. I want to grow the line steadily, and try to keep coming up with something unique and exciting. SS: The Padlocks were inspired by the practice of Love Padlocking in Paris and beyond. Where did you first encounter this practice? What was it about them that resonated with you? Andrew Bunney: It was Paris where I first saw this idea. Talking to people these past few days at the showroom, I realise a lot of people that have seen these locks were excited to encounter it for the first time too. Instantly I was drawn by the spectacle - a huge array of padlocks, most bearing some kind of inscription, attached for the length of the bridge. Thinking about it later, the idea is really very special. Someone took this common, ordinary item, and by appropriation gives it a different purpose and meaning. I like how it has become a new kind of symbol for a lot of people. I also like personalisation, and the idea that someone would engrave the silver-lock with a message in a similar way to those attached to the bridge is very appealing to me. It speaks of a time when people used to personalise more of their possessions. SS: Now, I know that these items were a long time in the making. Could you tell us the story? 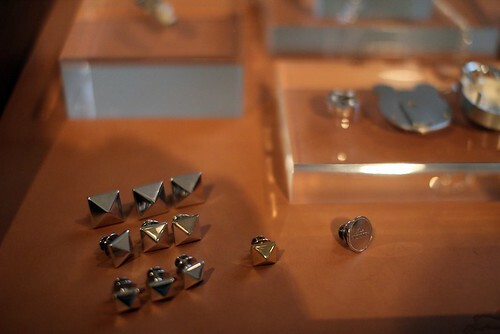 Andrew Bunney: For me, there are a few things which make jewellery quite different to clothing. Firstly it is the value in the materials used, secondly the longevity of the pieces - it isn't unusual for things to last for generations! Thirdly, the idea of the gift is very important. I decided that it would be very special to create padlocks in precious metals, and I looked to see if anyone was making anything like that. It's quite common to find small charms, but never anything that really works as a lock with a key and mechanism. As I researched more about locks, I realised how important an object it was to the UK. Once upon a time, when Britain was growing an Empire, a small town outside of Wolverhampton called Willenhall was charged by Elizabeth the 1st to make locks. Yale, Squire, Chubb, all these companies that you see on your front door all came from this one town. I started talking with a Museum to see if anyone was still handmaking locks, and I became really fascinated when I saw how traditional hand-made padlocks were put together. In some ways it looks very simple, which really added to the charm. Through a very long process I found what I believe to be the final locksmiths working, a father and son team, that can create an object like this although they had never tried anything as small or in these kind of metals. SS: These certainly aren't your average padlock. Could you talk us through some of the processes? 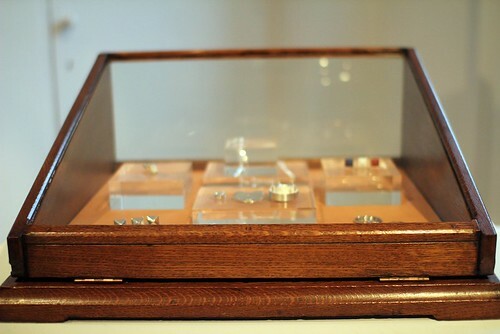 Andrew Bunney: Once the sizes were decided, I had locks made to the specifications that I wanted. The locksmiths had to develop the internal workings, and when that was ready it went to one of the workshops that I use to work out how best to construct it in silver. The mechanism cannot be silver because of durability, but everything else is. 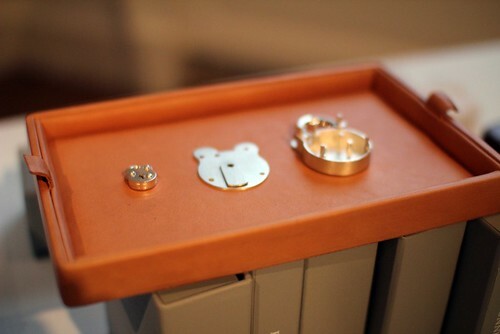 The style is known as the 'Old English Padlock', and this is very much the traditional English shape. SS: What has been the locksmiths reaction to your pieces? Andrew Bunney: The Locksmith isn't a trade that receives a lot of attention, and they aren't normally making something known for beauty, so possibly bemusement at first! But as the work progressed they understood more and the attention was really appreciated. It's actually very remarkable to see what they can do on a day to day basis - opening locks that have long lost their keys and making replacements, restoration work for Buckingham Palace, very unique problem solving. Converting it to silver isn't straightforward, so again it took a lot of patience. The beautifully carved paw. Yes, you've seen this image before but I love it so. SS: Onto the lucky rabbit's foot. The detailing is remarkable. Firstly, what inspired this piece? Secondly, how did it evolve in to the stunning piece we see today? Andrew Bunney: The Rabbit's foot is seen as lucky in many cultures, and for many years. Today I think it is known as a popular symbol or charm used by bikers - you can often see them with white ones, or sometimes dyed bright colours too. 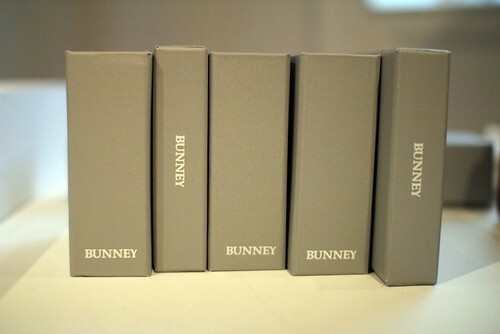 I see it as a natural fit or emblem for Bunney, something that anyone can wear. I had wanted to make a chain with no clasp at the back of the neck so it could fit anybody, and I wanted to have charms that people could wear with it. I designed a chain that has clasps to hang items from, rather than to attach together. This time I have a small padlock and the Rabbit's Foot. The paw or foot itself has been carved by an artist in London that specialises in making sculptures of animals, and so he worked from his studies and an original biker-style rabbits foot. 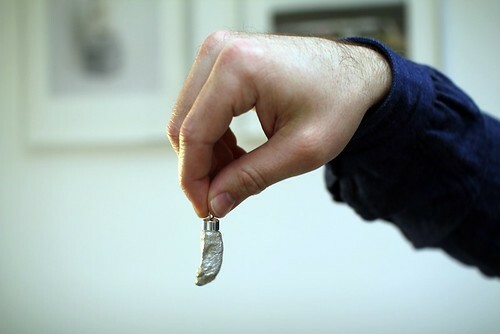 The foot is cast silver, and a polished cap is added. 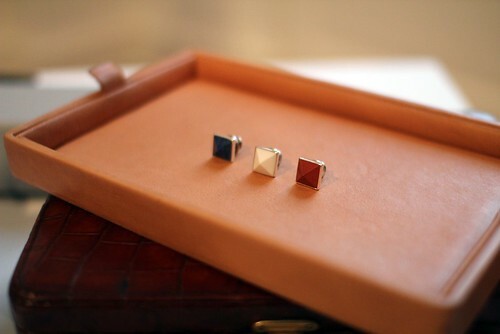 Andrew Bunney: Because this season the theme came from the Paris Love Locks, I thought it would be nice to make studs to reflect the Tricolor Flag. These are made with stones and then set in a silver mount - it's an update from the styles I made for Soph/Uniform Experiment last year. SS: Finally, what's next for Bunney? Andrew Bunney: To make new things and expand gradually. There are a few things I'm thinking about, but you'll have to wait and see!